The first Tornado prototype made its first flight on 14 August 1974 from Manching airbase, in what was then West Germany. Deliveries of production Tornados began on 27 July 1979. The total number of Tornados delivered to the German Air Force numbered 247, including 35 ECR variants. Originally Tornados equipped five fighter-bomber wings (Geschwader), with one tactical conversion unit and four front line wings, replacing the Lockheed F-104 Starfighter. 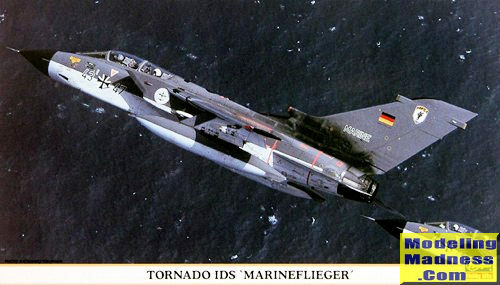 [ When one of the two Tornado wings of the German Navy was disbanded in 1994, its aircraft were used to re-equip a Luftwaffe's reconnaissance wing formerly equipped with RF-4E Phantoms. The German Tornado force is to be reduced to 85, with the type expected to remain in service with the Luftwaffe until 2025. Units operating the type are JBG 33, AKG 51 and the Holloman AFB training unit. The aircraft is still flying, albeit in smaller numbers with all of the initial operators. The Hasegawa Tornado was met with little enthusiasm in the US. Kits still languish on store shelves, despite being reboxed a number of times with interesting markings. Your editor is somewhat puzzled by this ambivalence as the kit looks to be very well molded and has more than passable detailing. In fact, it is really quite good. This lack of interest still continues as I got this one for a most reasonable price from an on-line sale. The interior has raised detailing on the instrument panels and side consoles as well as offering decals for these parts. Seats are probably a bit on the simplistic side and those wanting greater detail will supplant them with aftermarket bits. For the rest of us, they are not at all bad and will look the part. Wheel bays are separate and somewhat devoid of any detailing aside from some bracing. I know that there are hydraulic lines and electrical conduits that snake their way through. The wings are designed to be able to be swung forward or aft, and the builder will need to drill out mounting holes for the pylons on the lower wings as well as on the lower fuselage section. Unlike the F-111 kits, there are no droppable flaps or slats on this one. This type of aircraft invariably means an aft fuselage split horizontally to trap the wings and the forward fuselage split vertically. No requirement for nose weight is offered, but you may wish to add some just in case. Speed brakes are separate and can be displayed open or closed. Most of the time, these were closed. A separate, and very clear windscreen and canopy are provided, but no canopy actuating mechanism for showing it in the open position. For the IDS variant for which the decals are provided, you'll have to fill a few holes in the fin halves and also do a bit of trimming. For those wondering, It appears that all the bits for a GR.1 are included in the kit, just not shown as used. For things under wings/fuselage, there are outboard jamming pods, then fuel tanks with Sidewinder mounts. These fuel tanks have separate fins and both German and RAF types are offered. For the centerline, you are provided a pair of Martel anti-ship missiles. Instructions are well done with the usual Gunze paint references. 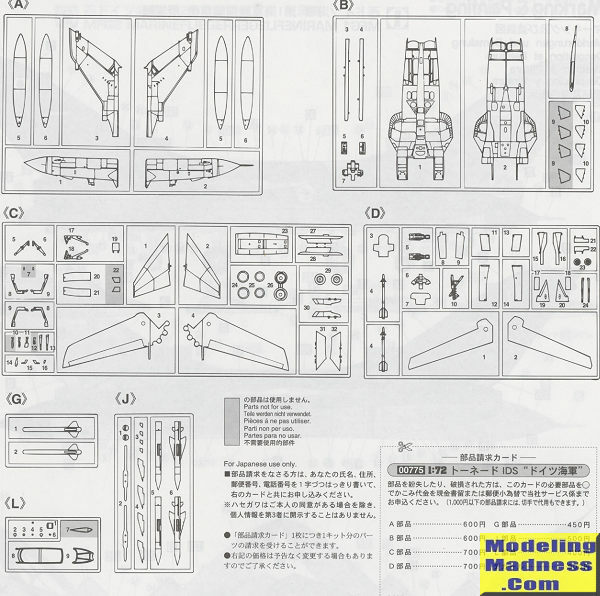 The two markings options are for a grey over white plane from MFG 1 as shown on the box art, and a later three color wraparound scheme for the MFG2 option. This is in all probability the Norm 87 scheme of Basalt Grey, Grey-Blue, and Green-Grey, which are not typical Gunze paints, hence the rather odd callouts provided. You can find more info on the net. 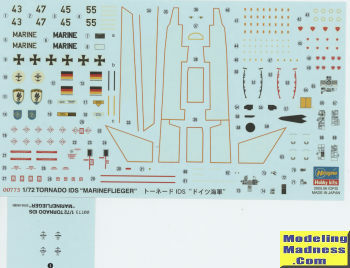 Decals are nicely done and the small addendum contains the low viz anchors for the MFG 2 plane. This is really a very nice kit. It is a shame that it doesn't get built all that often and frankly, I have only seen one finished and that was a review here about a decade back. It is one that deserves more bench time, so if you see one, pick it up. Thanks to for the preview kit. You can find this kit at your favorite hobby shop or on-line retailer.